The thoracic outlet is the area of the lower neck and upper chest. This area has a variety of nerves, blood vessels, muscles and bones that run through a fairly small area. 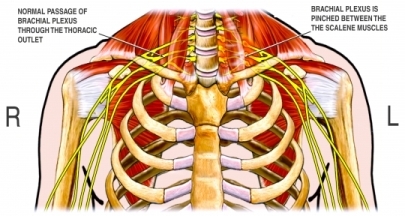 When the nerves and blood vessels of this area are compressed, irritated or injured they can cause a range of symptoms known as the thoracic outlet syndrome. Treatment varies depending on a patient's specific symptoms. In most cases, thoracic outlet syndrome is managed with pain medication and physical therapy. A physical therapist will design some some exercises for you. The exercises will help to relieve symptoms by relaxing nearby muscles, improving posture and reducing pressure on nerves and blood vessels. Thoracic Outlet Decompression. The goal of surgery is to move or remove the source of the compression. In some people, this may involve removing part or all of the first rib to make more room for the nerves and blood vessels. There are no current guidelines to prevent thoracic outlet syndrome.